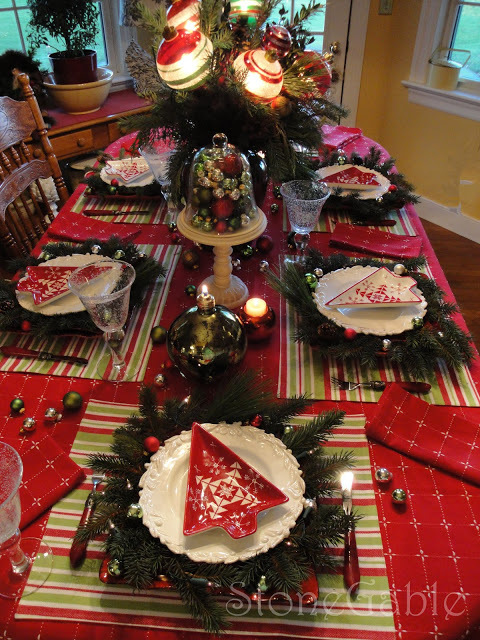 Festive and fun, this tablescape is relaxed and decked out in tradional colors! 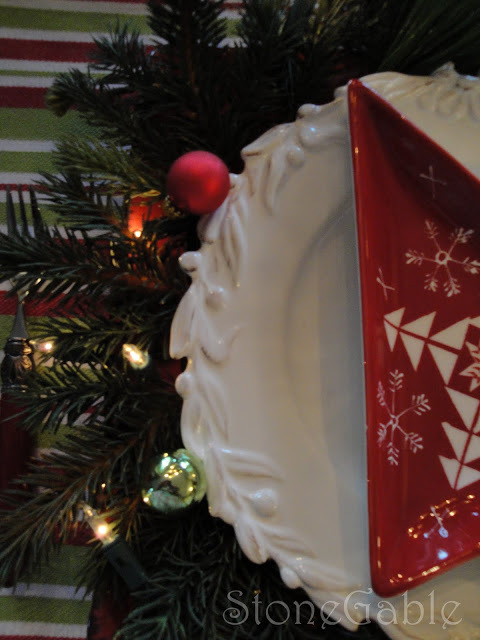 I have posted two very formal Christmas tables so I wanted to create a happy casual table in my kitchen. ORNAMENTS!!! 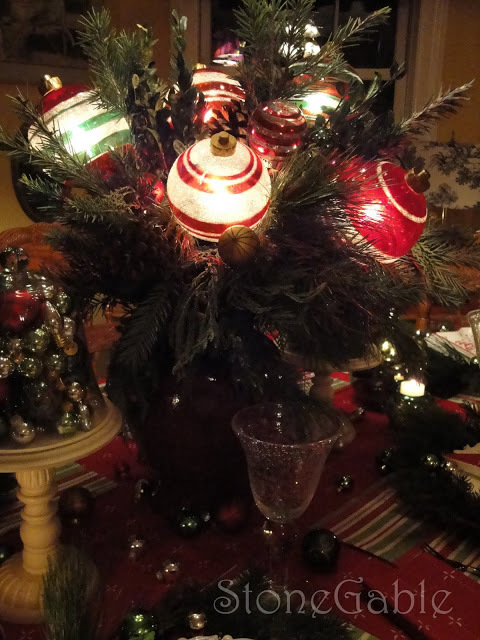 The other inspiration are these big lit ornament balls that I used in a centerpiece. I found them at the “Old Millhouse Shoppe” one of my favorite local shops. 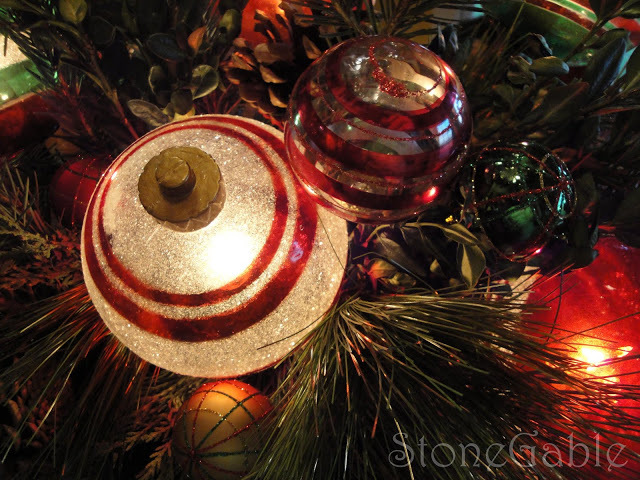 ( Look for a field trip in January) The ornaments are on long stakes, meant to be used outdoors to line walkways,etc. 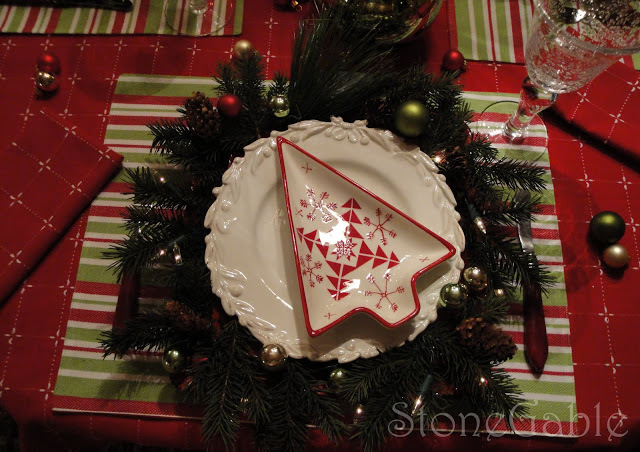 But I saw them and just knew that I wanted to use them in this tablescape! I found red forks and knives at HomeGoods… very reasonable. I used them on my Thanksgiving dessert buffet, and at my cookie exchange. I love them! 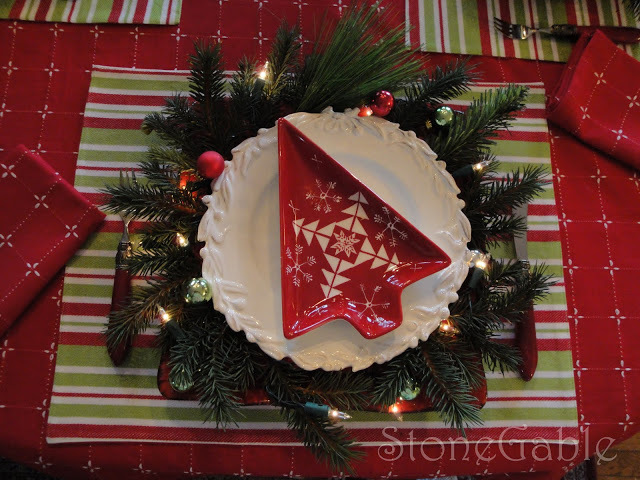 The anchor of each placesetting are large red square plates. On top of them are matching red smaller plates. They are really not noticable, but act to elevate my favorite white berry edged plate. 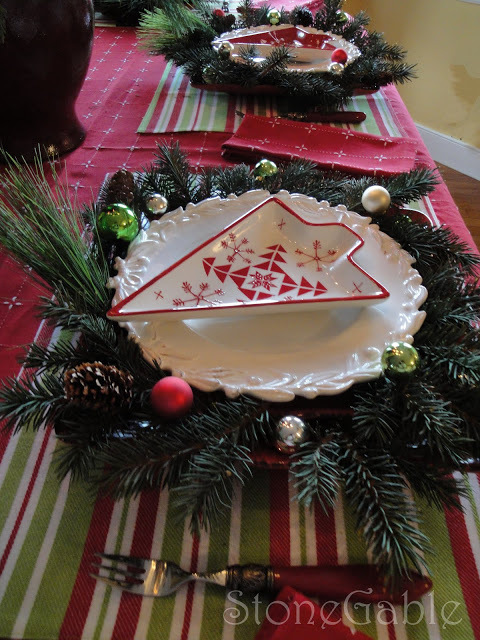 And of course they are topped off with quilt print tree plates. 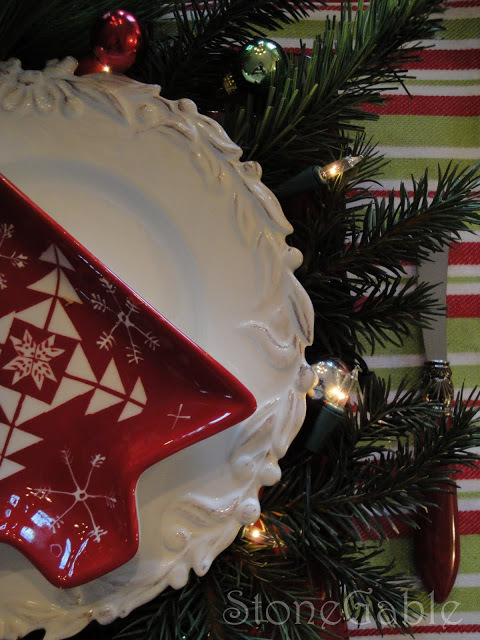 I encircled the white plate with greens by tucking little bits of faux greens between the two red plates. 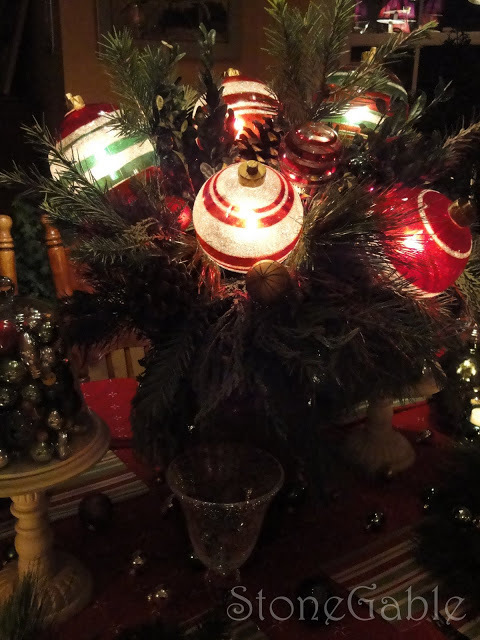 I added a string of 15 bulb mini lights (battery opperated) and small glass balls. 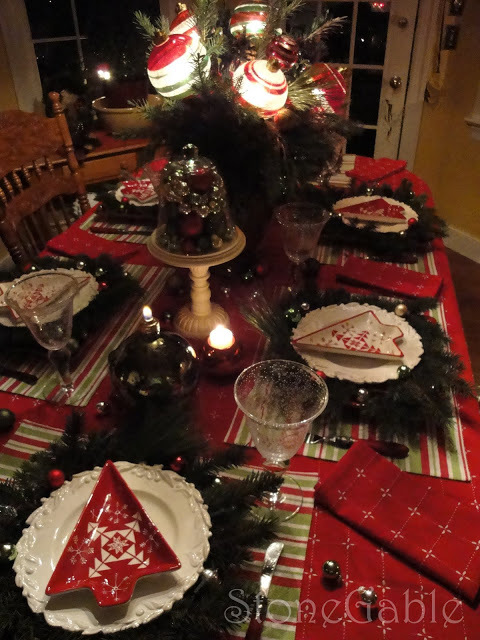 My oringinal idea was to light up each placesetting, but two of the strings of lights did not work! UGH! I got these lights about a month ago, not close to home so I could not run out and return them. 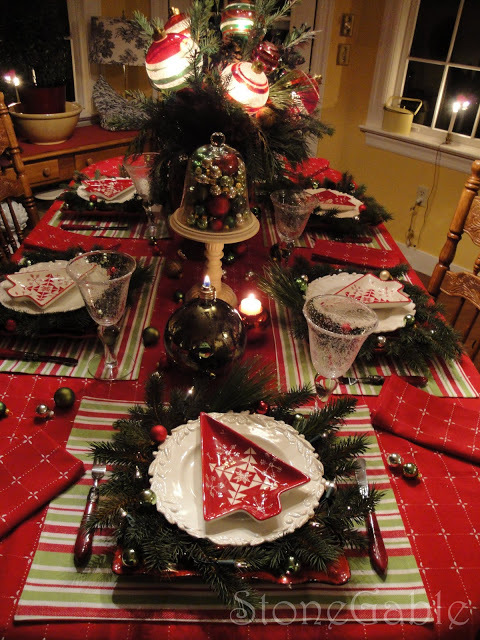 I lit the placesetting at the heads of the table. When I return them, I will light all the placesettings. Very impractical, but pretty and fun! 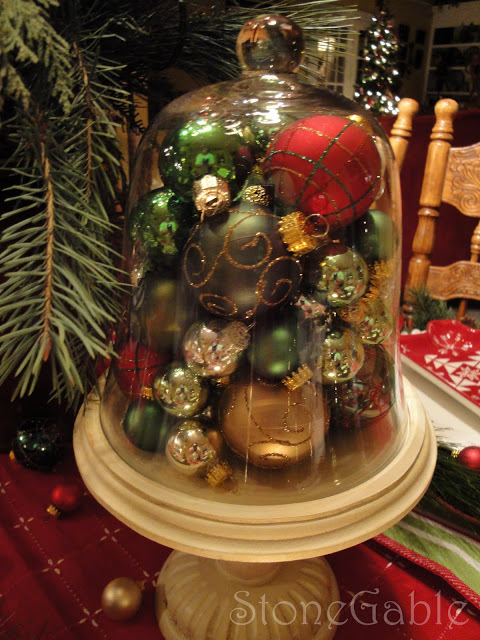 Continuing the ornament theme, I filled two cloches with red, green, white and metalic balls in different sizes and patterns. I’m sure you recognize these cloches, they are the only ones I have and I use them so often! Looking like giant Christmas balls, these green oil candles are a fun surprise! Sitting next to them are a red and green ball tea light holders. 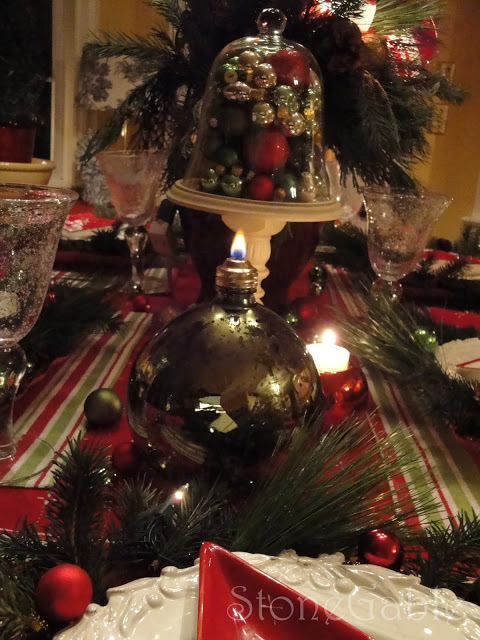 Greens from my yard arranged in a deep red ginger jar become the centerpiece for this table. 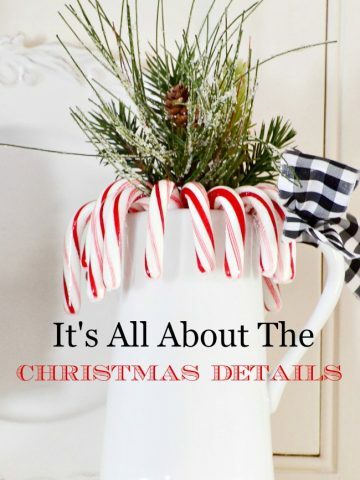 The lit ornament inspiration pieces are tucked in the arrangement, as are other Christmas balls and pinecones. 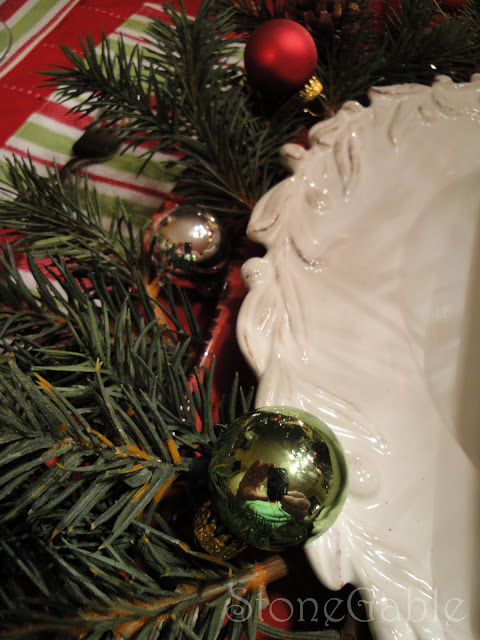 These ornaments do have a plug, so I ran it down the back of the ginger jar and under a placemat. 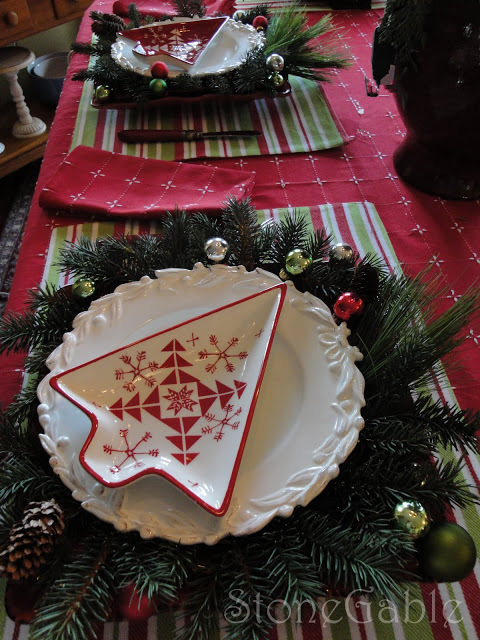 If I were using this tablescape ( I will at a later time) I would make a large button whole in the tablecloth and tape the cord to the table under the tablecloth. I am just crazy about these brilliant big and fun ( keep saying fun… I guess that is a reoccurring theme!) Christmas balls. I will move them to my family room and put them on an end table. 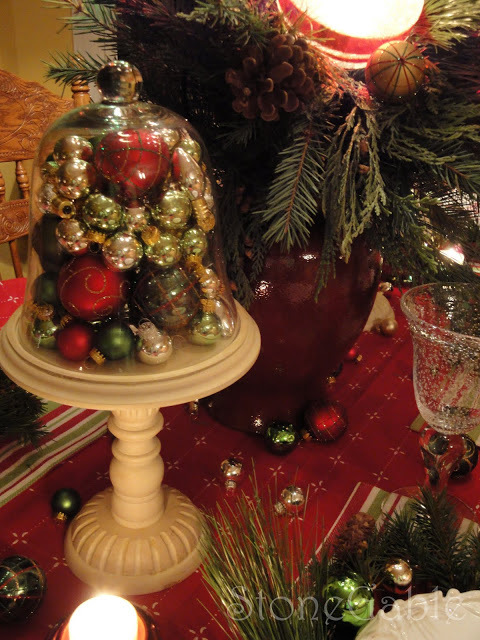 To complete and continue the theme, I tossed ornaments around the table for added color. 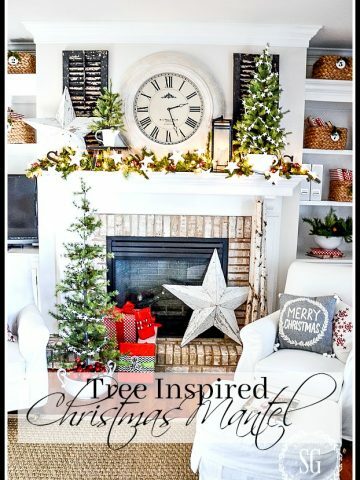 Cozy and inviting and full of Christams Spirit was the look I was trying to achieve. 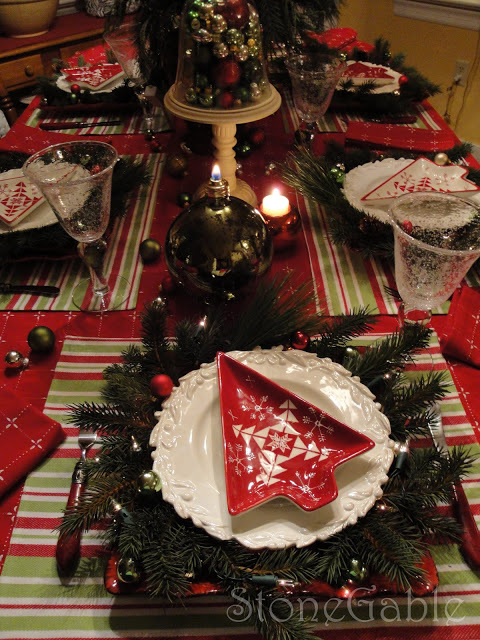 I want my friends settling in for a comfort food meal, beautiful Christmas music and lots of laughter. 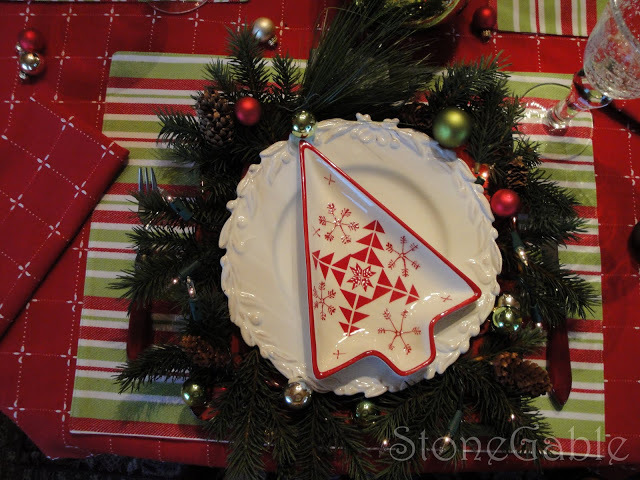 I am joining Susan at Between Naps On The Porch for Tablescape Thursday. Thanks for being a wonderul host, Susan. 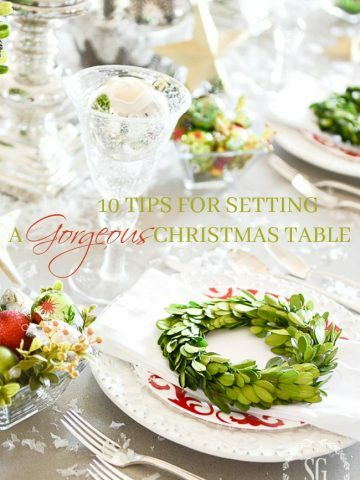 Please go see all the inspiring Tablescapes and creative ideas! I think you are so talented and creative! 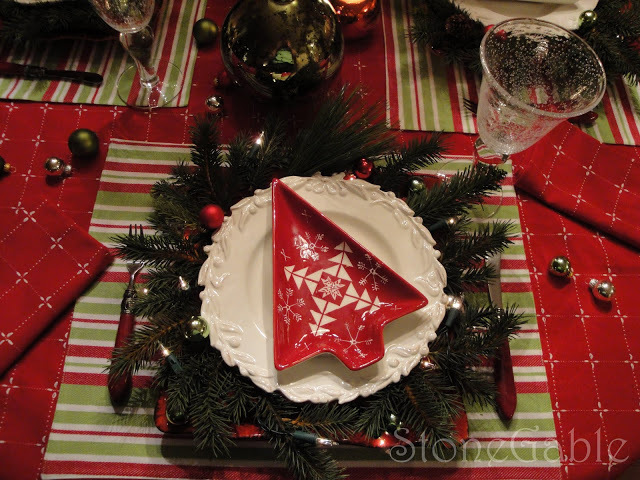 I fell in love with this table setting…as did my Grandma. She even printed it off and goes on and on about how much she loves the dish patterns. We were wanting to try and find them for her as gifts throughout this year so she could have them next year. Is it ok if I ask the patterns of both the white dishes and tree shaped dishes. ? What a beautiful table setting. I’m featuring it in my blogpost today. I’m very impressed! 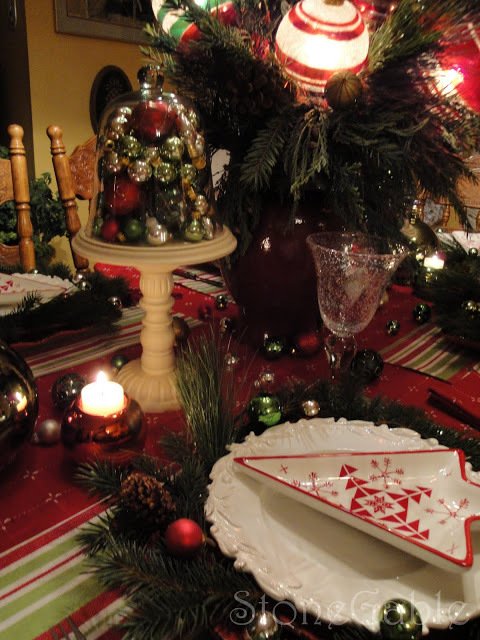 Totaly talented you are Ivonne…what a terrific and gorgeous tablescape…congrats I love it! Yvonne, this is beautiful. I love the entire table. I can’t believe the lights around the wreaths. 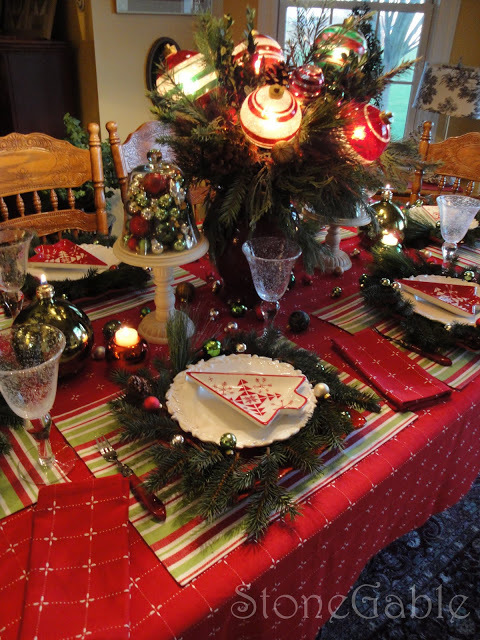 It’s amazing; the red tree plates, the white plates with berries around it and the incredible centerpiece. I was too busy to look at blogs before Christmas but I’m so happy to have gone back to look at this one! You put Sandra Lee TO SHAME!!! This table is incredible and I want to eat by it!!!! 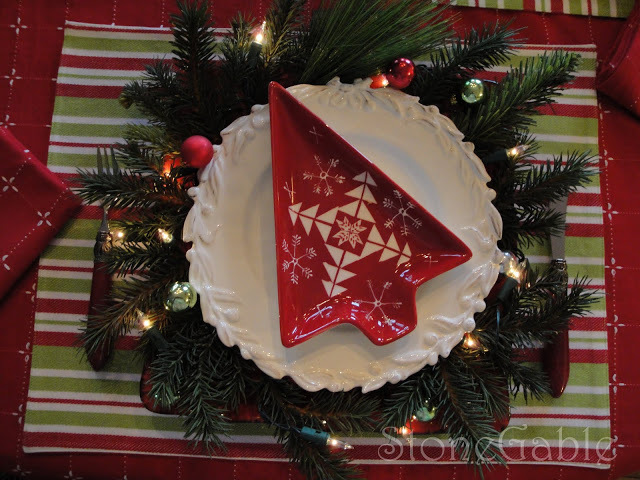 I just love the little lights around each plate!!! And that centerpiece is to die for…gorgeous!!! I’ll be back! I’m really enjoying my visit here. Think I’ll make you my new friend to post about on Pink Saturday. 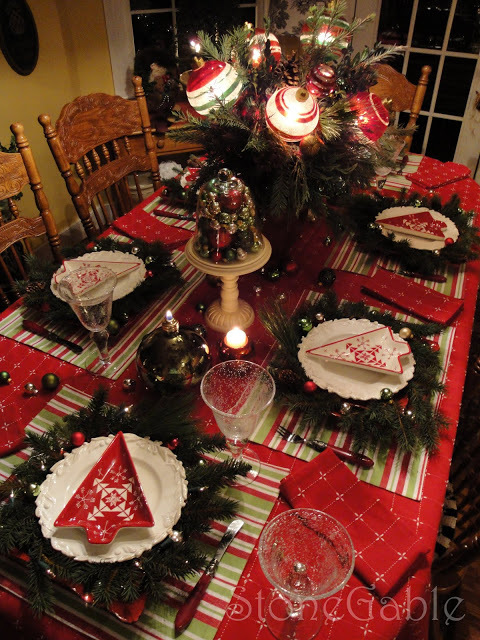 Hi Yvonne, I’m commenting late…but this is just such a festive table, I had to leave you a little note! Red and green is always my favorite and you’ve done a wonderful job putting it together! The linens and the white berry plates is my fave! I’m glad you stopped by my blog and commented, otherwise I would not have found your posts. There are so many linking to these popular memes that I cannot read them all. I love your tablescape. 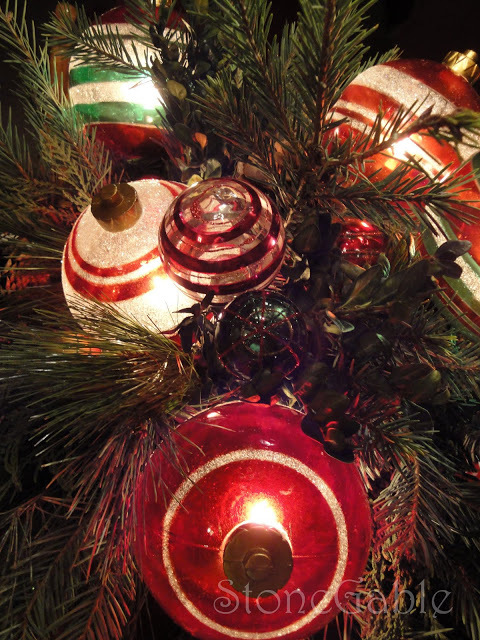 Those lighted balls in your centerpiece are fabulous. I love the cloche, too. 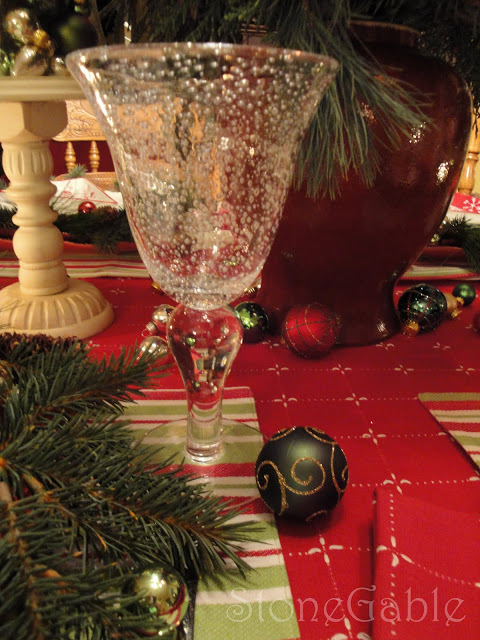 Your table is very festive. Thanks for your nice comments. I am sure everyone will love it. So festive, cheery and..
Merry Christmasy! The best to you and yours! This is beautiful! I love your centerpiece! Fantastic! And the wreaths as chargers — such a cute idea! You are so very talented & clever! How beautiful it all is! The wreaths as chargers are so cleaver. I’ll be copying that! I love those big light-up ornaments, too! Yea for red and green! Thanks for sharing and inspiring! Happy Holidays! Lots of !!! 🙂 Oh well, it’s 10 stars out of 10 from me. It’s just such a happy post. Stunning table! I wouldn’t mind being a guest sitting at your beautiful table. Everything is just beautiful. You did an excellent job. love the small touch on top of the light shades. This is just brilliant!! WOW! What original and fun idea you have. Love the seeded glasses and the flatware especially, but your decorative touches are incredible. Fabulous!! Absolutely lovely! You are ready for Christmas. Have a great day! LOVE your centerpiece. Everything looks so festive and colorful. Inspiring! I love your centerpiece. So unique and original. 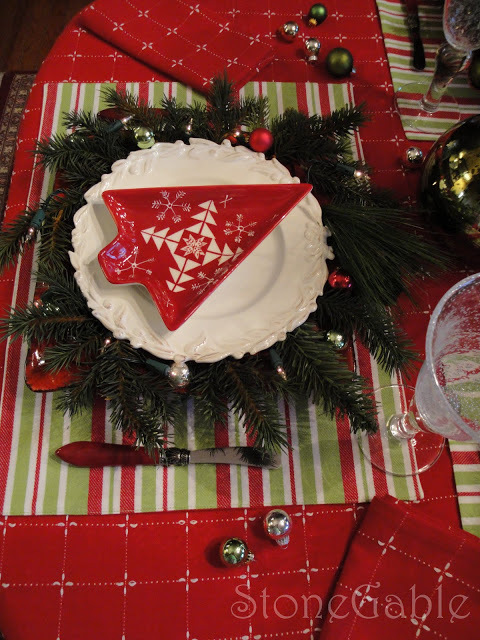 Your plates, napkins and your whole theme is perfect. What a spectacular table you have set for your lucky guests. do you have space for 2 visiting Europeans?? 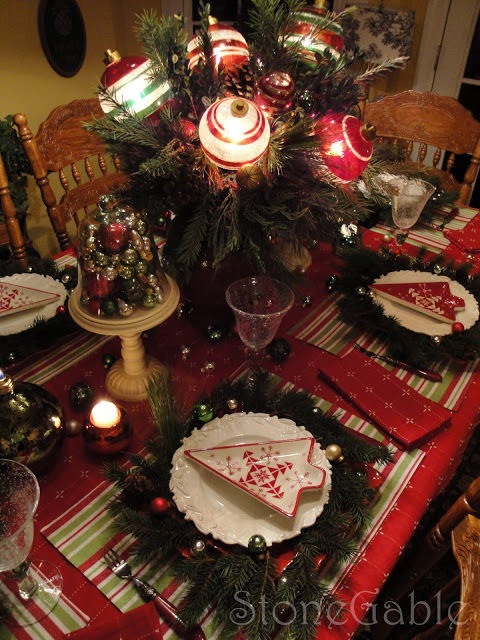 The centrepiece is amazing, the lit up ornaments are fabulous, I can see why you love them so. Thanks for coming to my blog. I am so happy to have a new friend! I just came to visit you and just love your blog. The table scape you did is absolutely gorgeous. That is sooo much work to get all that loveliness together. My favorite, like you, are those great Christmas balls. So Fun!! 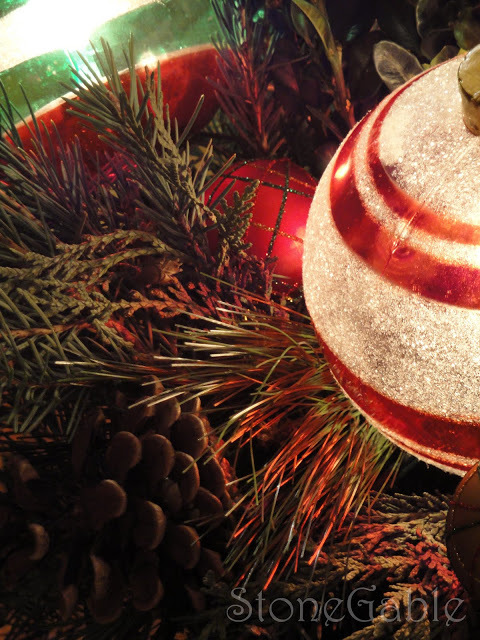 Enjoy the days leading up to Christmas! 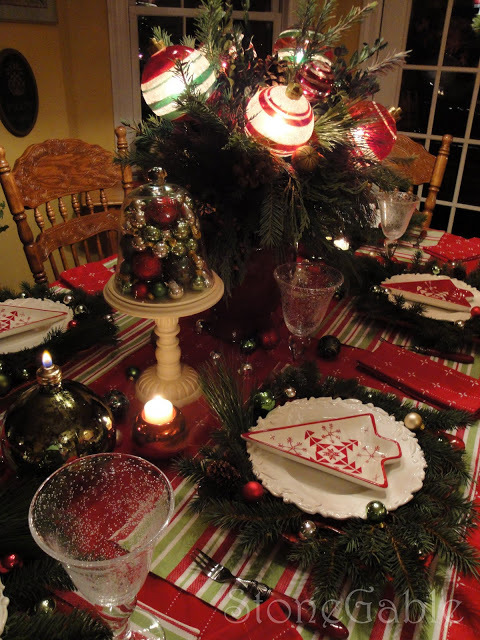 I love those little Christmas tree plates, those are the cuttest thing and the whole tablescape is soooo pretty, love it.. 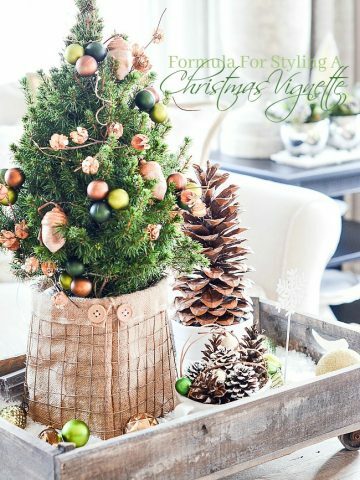 The huge ornaments are perfect for your table arrangement. 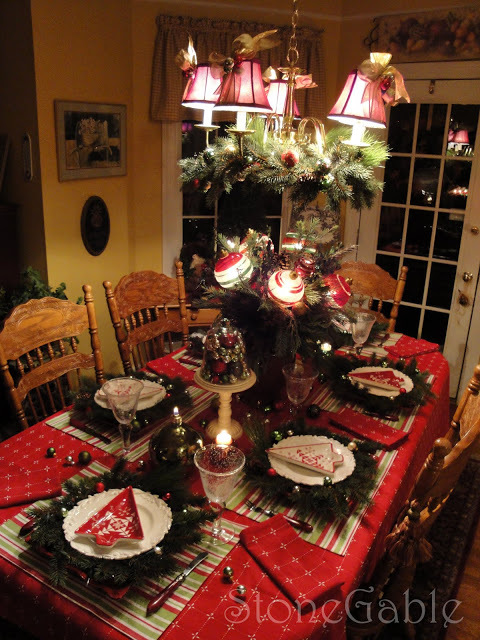 What a lovely table…the centerpiece is my favorite…all of it is really amazing. This is just too much! I love everything about it. The ornaments in the centerpiece want to come live at my house! 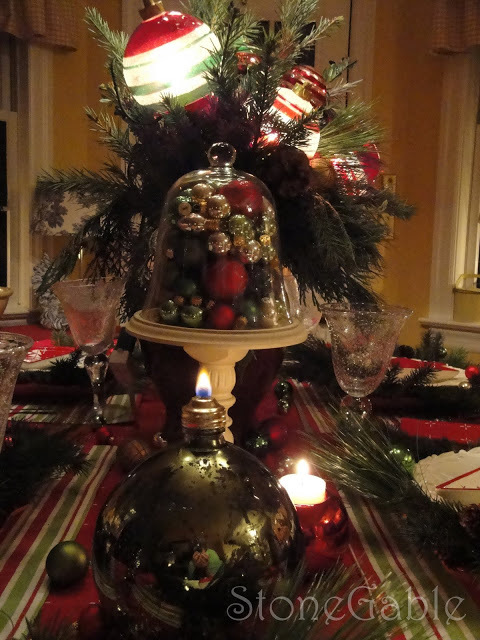 Love the dishes, the scattered ornaments and the cloche(s). 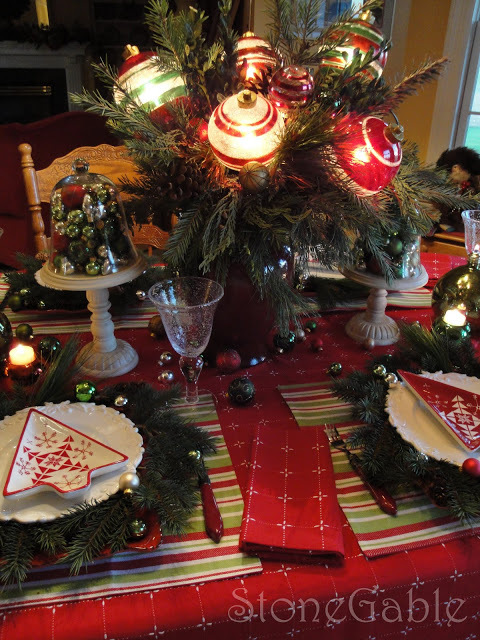 You are putting lights around each place setting…Oh my! This is truly one of the best ever! Pretty, pretty, pretty ! 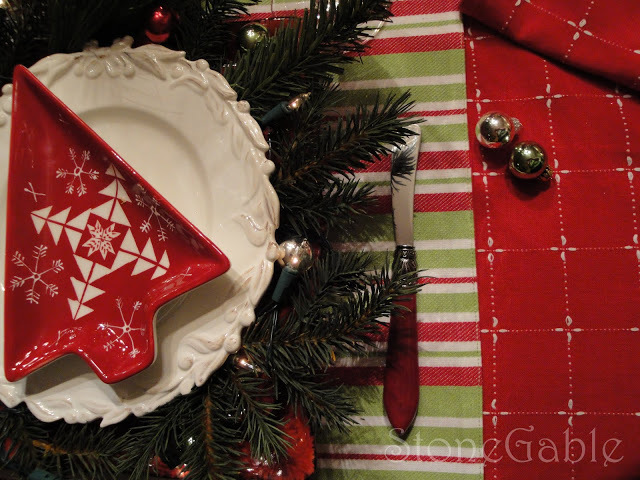 I love those white plates – so much texture ! Love the tablescape. You have such a creative and imaginative mind! The table is just breathtaking. I made a post for you tonight. Let me know what you think of it if you try it out! 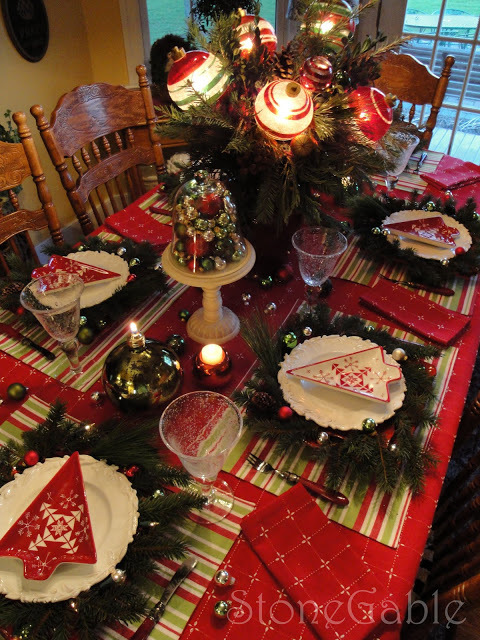 Your table is fantastic and so very festive. The centerpiece is a show stopper. Beautiful little lampshades too. You thought of everything. Absolutely gorgeous! I wouldn’t expect anything less from you! 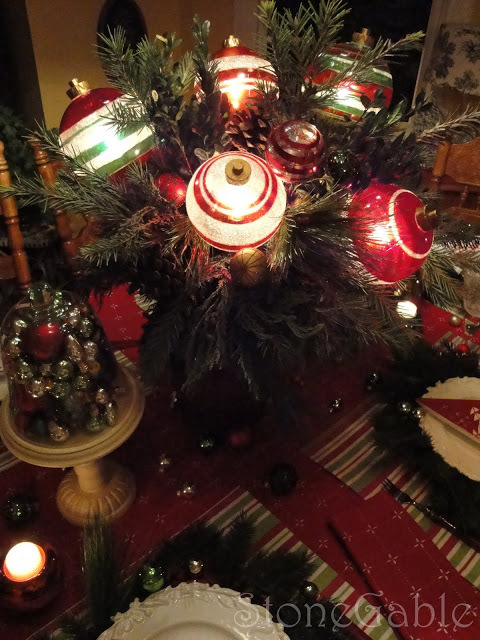 Loved seeing your beautiful table and I just think the light ornaments in the centerpiece are the greatest…Happy Christmas! Stunning…everything is perfect. I love your combinations and all the differant things to see…this will definetly keep your guests busy in conversation. I love the centerpiece. A gorgeous table!! 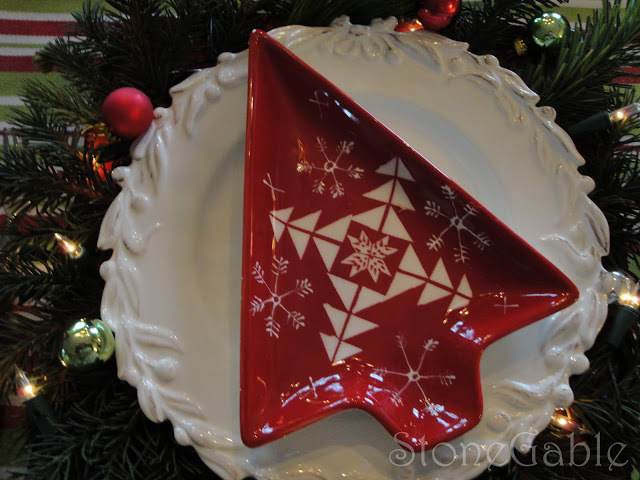 I just love those tree dishes….actually I’m coveting them, lol. Such a great tablesetting. 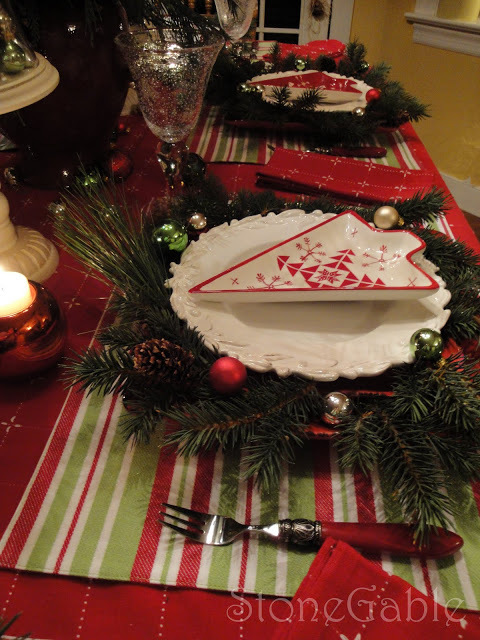 I really like the bright red combined with the lighter green of the placemats. My favorite combo! I love this table setting. Fun and laughter? You got it! Love Love Love the centerpiece ornaments that light up. How clever you are to see uses for them other then the intended. This table put a smile on my face.